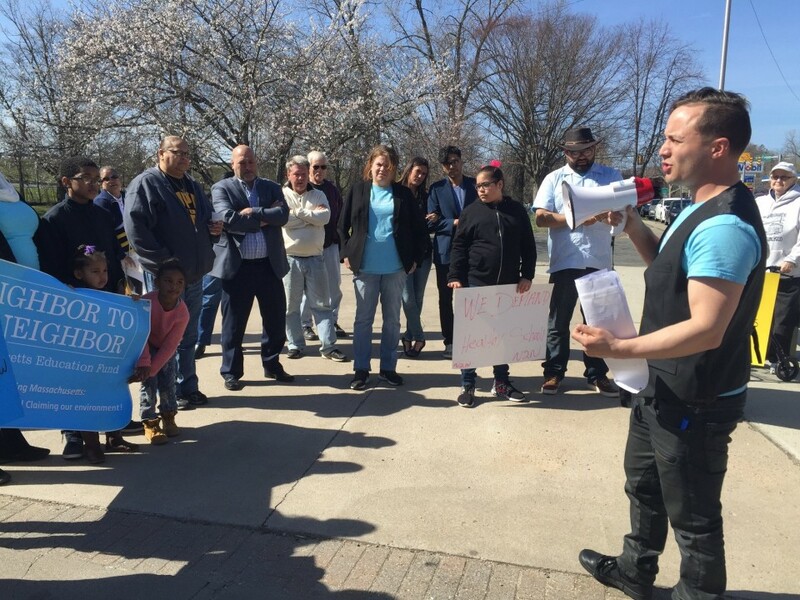 SPRINGFIELD ‒ Stressing that “enough is enough,” North End residents and community activists called on city leaders Saturday to address structural and environmental issues at German Gerena Community School. More than two dozen protesters, including City Councilors Adam Gomez and Bud L. Williams, gathered outside the school’s Main Street entrance to bring attention to mold and other issues that they claim plague the building and its related tunnel system — hazards denied by a top city official. Jafet Robles, a community organizer for Neighbor to Neighbor who led the protest, said the rally officially kicked-off efforts to address issues relating to the school. As part of the new push, Williams announced that he and Gomez plan to sponsor a non-binding resolution in the City Council looking into if and how Springfield can fix the problems at Gerena. “We want to know the answers,” he said, contending that the school never should’ve been built where it was due to the water issues in the area. Gomez, who said he was unable to attend Gerena for years due to water issues, stressed that the community wants to be able to offer students the best education possible. While he stressed that protesters aren’t suggesting that some of city leaders haven’t wanted to try and address the problems, Gomez pointed to the lack of progress. “It’s been 20 years that we’ve been fighting,” he said. Despite the concerns raised by protesters, Patrick J. Sullivan, the city’s director of parks, buildings and recreation management, said Friday that Gerena school is “very safe” and in excellent condition. He pointed to a number of renovations and repairs completed in recent years, as well as additional projects planned with a grant application to the Massachusetts School Building Authority. Members of Neighbor to Neighbor, Women of the Vanguard, the New North Citizens Council and other community organizations attended the rally.